Stefano had been complaining about not feeling well more or less since Wednesday…and I kept telling him to take his temperature but, no, he didn’t think he had a fever. Men. On Friday morning he woke up feeling simply awful, but he told me that he had to go to work. He didn’t last long. After swinging by our doctor’s office, he was home by lunchtime. By then he had a temperature of 38.2° Celsius (=100.76° Fahrenheit). Eh. On Saturday morning, it was my turn…not surprisingly, given my itsy bitsy teeny tiny immune system (a feisty little one, though!). Well, to make a long story short, Stefano and I spent the weekend in bed, lovingly nursed by all five cats. Yesterday evening my temperature went up to 39.1° (=102.38° F.). Wowsie. But this morning it is back down to 37.7° (=99.86° F.). And Stefano’s temperature is normal. The worst appears to be over. Do you remember my post on gadolinium? If not, here it is: http://margaret.healthblogs.org/2009/12/13/the-gadolinium-used-in-mris-makes-myeloma-cells-proliferate/ (there is also a corresponding Page, which you can find by scrolling down my Page section on the right). Yesterday I finally finished editing the technical translations (concerning the inner workings of leather-processing machinery…ah, you have no idea…zzz!) that I had been working on for days, now. A bigger job than I had anticipated, but, phew, it’s done. I had no time to do any blogging, though, uff. But today I am baaack! 🙂 And I am going to post a couple of links to random things I have been reading during my work breaks. First, here is the link to a study I learned about from a Facebook friend (thanks! ): http://goo.gl/rI9fq Yes, yet another MGUS-SMM progression to MM study. Hmmm, they seem to be popping up like dandelions these days, don’t they? That is good, of course! The more we learn, the better off we are. And this study is also a relatively easy read. If you don’t have time to read the whole shebang, though, just jump to the Summary at the end. Here is a particularly interesting titbit, which you can find in the paragraph titled “From ‘Multiple Myeloma Without a Progressive Course’ to Smoldering Multiple Myeloma”: basically, before 2003, there was a bit of confusion on how to define asymptomatic myeloma. Some studies, e.g., made a distinction between SMM and IMM (or indolent myeloma). This lack of consensus means that, Due to these varying definitions, one has to be cautious when assessing results across different studies. In fact, it is very problematic to compare SMM data collected prior to 2003, the year that the International Myeloma Working Group (IMWG) released a consensus on the specific diagnostic criteria for the known monoclonal gammopathies. By the way, IMM has now been lumped in with MM, whereas SMM is defined as “asymptomatic myeloma.” I must say, I found the news about how difficult it is to judge SMM data before 2003 a bit troubling. Too bad! Now for something entirely different. Have you ever heard of “fenugreek”? If not, see http://goo.gl/ML9Iu I have used it in some of my Indian dishes…curries, e.g. Fenugreek is a plant, but the parts we use in the kitchen, as far as I know, are its teeny tiny seeds (see the rather blurry photo I took of my own organic fenugreek seeds). 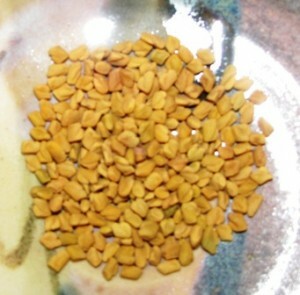 But there is more to fenugreek than I thought: http://goo.gl/CjIQu According to this “Telegraph” article, fenugreek seems to have a rather powerful antiviral activity (like curcumin! )…so much so that it might help prevent our developing colds in the winter months. The volunteers in an unofficial-sort-of-study, half of whom already had cold symptoms, took a half teaspoon of fenugreek seeds twice a week (boy, talk about easy peasy!). The symptoms experienced by the “cold-ridden” folks improved significantly, whereas the people who usually developed colds in this period remained healthy. Interesting, no? Since I am not one to shy away from tasting non-toxic substances that might be good for me, I decided to try some of these seeds. To me, they tasted a bit like, well, burnt celery…Yes, I know, that sounds terrible, but I can assure you that it was not. Not really. What I found a bit unpleasant was their extreme crunchiness…So I think it might be best to cook them, not eat them raw. Hello there!!! Ciao a tutti!!! 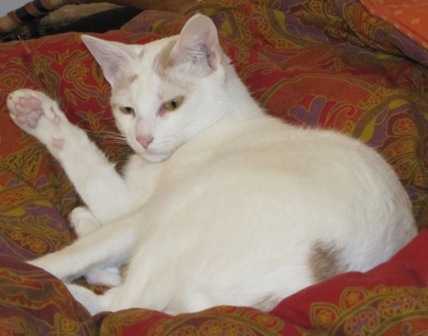 In the meantime, I hope you will enjoy this photo of Pinga waving a big (& rather sleepyzzzzzz…) “hi!” to everyone AND this video: http://goo.gl/fEfmr. This is definitely one of THE funniest, and at the same time most adorable, videos I have ever watched on YouTube: http://goo.gl/3PNPz (And hey, I am not even a dog person…) Enjoy!!! I had to take a break from translating this morning in order to find out what documents I needed, if any, to renew what in Italian is called an esenzione, that is, an exemption from paying a small fee, called ticket (no really, that is what it is called; it is pronounced “teekit”) for tests, hospital care, prescription medicines and so on. In February of 2006, that is, after my MGUS became MM (on paper, you see, there is no distinction between MM and SMM, so I am officially a MM patient here), I applied for, and was granted, a healthcare exemption, which lasts for five years. This has meant that for the past five years I haven’t paid one cent for any prescription drugs (antibiotics, e.g.) or for any blood/urine/other tests. When I was still MGUS, though, like all healthy Italians and residents of Italy, I paid a “teekit.” I think the most I ever paid was more or less 100 euros (= about $ 130), for my bone marrow biopsy in 2005. Of course, given the choice, I would rather pay the healthcare “teekit,” since that would mean I don’t have cancer anymore…! Okay, back to us. Yesterday I phoned my local health office, = ASL, to see if someone could tell me what steps I needed to take to renew my exemption. “Ah, signora, I have no idea. You must call back tomorrow morning,” I was told by a very nice but not very helpful man. So I called back this morning and was told the following: “Ah, signora, you must come here yourself and go to this-that-and-everything healthcare office.” “Can’t you tell me over the phone or find someone who can?” I asked. “No, sorry.” Okay. Fine. I grabbed all my health-related documents and went over to the ASL office. I don’t have to show any proof that I still have cancer. I don’t need another BMB. I don’t have to be seen by an ASL doctor. No. This will be easy peasy. But really, on second thought…Couldn’t the simple information about my exemption have been given to me over the phone? Was it really necessary for me to go over to the ASL office? Now, I am not complaining about the time I wasted, since I can work on my own schedule…But what about people with jobs? Why make them take time off work just to let them know that they will have to come back later…taking more time off? You make plans, then something happens, and all your plans go out the window. That is what happened to me this morning, when I received not one, not two, but THREE (!) translations–two of which are extrrremely technical–that I must finish by the end of this week. Gulp!! !